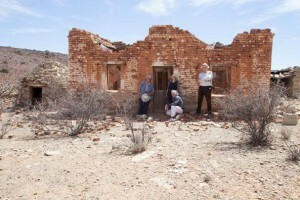 Pat Kramer and a group of fellow Vernackers have been travelling around the Karoo for a decade locating and recording corbelled buildings. Recently Nigel Amschwand began a research project on the Basters of the Kareeberge and the effects of the border moving from the Sak River to the Gariep (Orange) River in 1847. Therefore, in addition to looking for corbelled buildings, we have also begun to investigate farms with Baster connections in the Kareeberge. This presentation is a record of the vernacular structures on farms as well as buildings in the towns of Sutherland, Fraserburg and Williston that we recorded on our field trip in April 2015. Pat Kramer completed her Honours degree in prehistoric archaeology many years ago and, after a career in publishing, returned to archaeology – this time historic archaeology – to follow her passion for locating and studying corbelled buildings in the Great Karoo. Her work earned her a M.Phil from the University of Cape Town and she is busy working on a book about corbelled buildings.